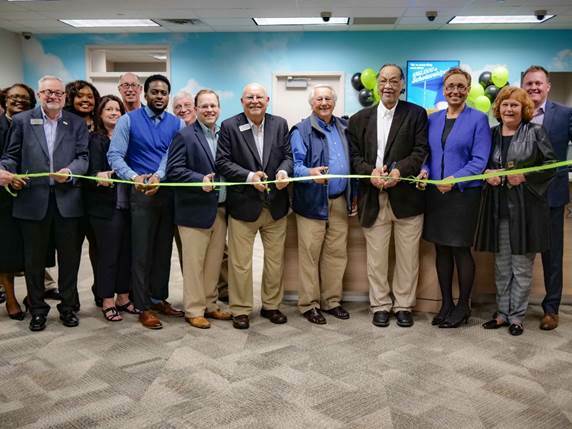 AUGUSTA, GA (March 28, 2019) — Peach State Federal Credit Union hosted a ribbon cutting ceremony to celebrate the grand reopening of their branch located at the Richmond County Board of Education (RCBOE). Local officials, credit union staff and community leaders were in attendance for the ribbon cutting. The branch went through a full renovation over the winter break and officially reopened on February 19th. This full service branch location features a state of the art teller pod with the goal of providing faster, more efficient service to members. The Richmond County School System has enjoyed a long relationship with Peach State. The branch offers a convenient place for the Board of Education staff and visitors to bank. Dr. Angela Pringle, Superintendent of Richmond County Schools shared her excitement about the new space. “Having a branch inside our building is an added benefit for our staff and I know they will love this new, efficient space,” she remarked. Peach State is a $516 million credit union that serves almost 60,000 members in Georgia and South Carolina. Operating as a not-for-profit financial cooperative, Peach State’s mission is to provide quality financial services that meet the needs and exceed the expectations of its member-owners. For more information, visitwww.peachstatefcu.org.